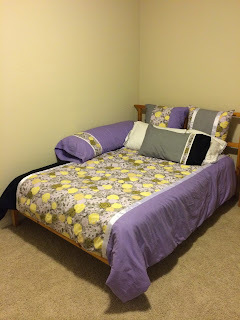 After endless web searches for a duvet comforter cover that incorporated gray, white, purple and yellow for my daughters room, I came up empty. I then turned my attention to the nearby Jo Ann's fabric store and found something! My mom & I sketched out a quick pattern since we had the measurements. First, for the front - we measured 21" x 86" and cut the purple and black fabric then we measured 42" x 86" and cut the floral paisley fabric. For the back - we measured 21" x 86" and cut all four colors of fabric. Then sew it all together by matching RST! Iron the fabric each step of the way since this cotten gets wrinkly. Next, we took white gross grain ribbon and pinned over the seam on the front of the duvet cover. Top stitch ribbon on both sides. 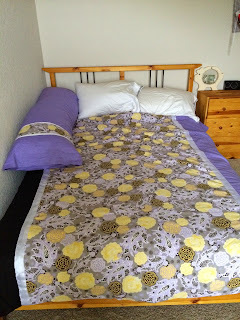 With RST sew the top and sides of duvet cover. Fold 2" up on the bottom and pin it in place. Next, measure 8" in from both side seams. Now measure and mark 8.5" segments (8 total). Do this for both sides. Make button holes on one side and stitch buttons onto other side or if using velcro skip making the button holes. Finish by sewing RST 8" in from either side. Turn right side out and slide in duvet. All finished! We also made matching pillow covers for the body pillow, regular queen pillow as well as two oversized square pillows using similar ideas but played around with the remaining fabrics to make it work. 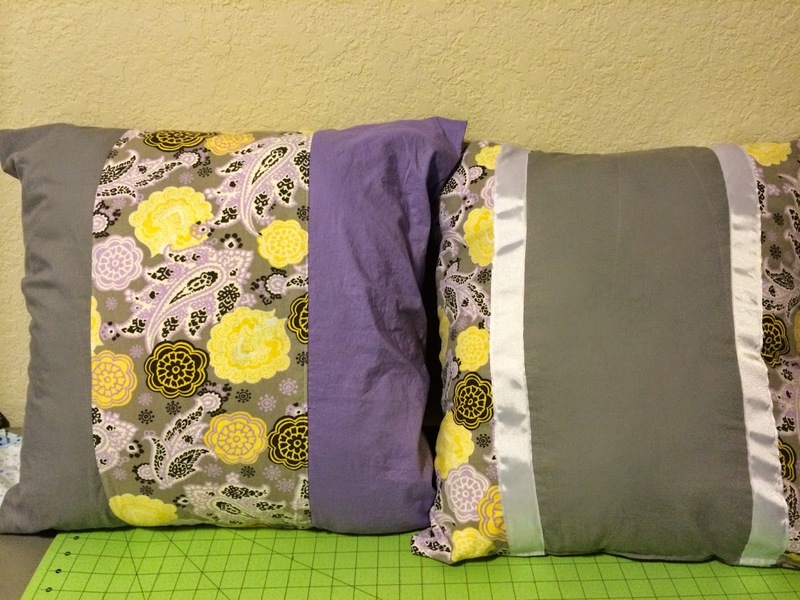 Cut 9.5" x 50" in the floral, gray and purple fabric. Then with RST sew together creating a 3 paneled strip. Next, take the zipper and pin to each side. Finish by sewing RST on either side of the zipper and then sew together the edges. Turn right side out and stuff in throw pillow! I loved the way it turned out but most of all my daughter loves it! 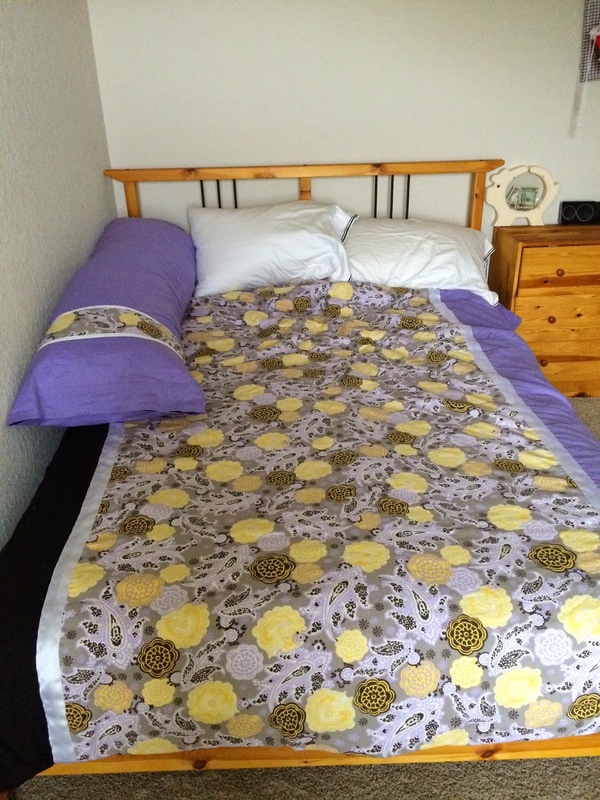 She had requested flowers and the color purple so this turned out to be the perfect fabric combo. The cutom duvet cover sets on Etsy are quite pricey so another bonus for me by making this set was it ended up saving me a bit of money. importantly so did my daughter. 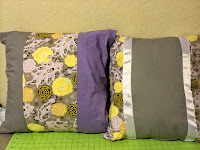 There is a bit of leftover fabric so we made matching throw pillow covers. See next tutorial.